Crisis: While America Slept by Martin Clem is a gripping terrorist thriller with deep layers in the plot, plunging readers into a world where nothing is as it seems. Readers are introduced to the fight against ISIS, a familiar subject to contemporary readers, but in the hands of a master storyteller, it reaches a whole new level. Elizabeth Jennings is obsessed with rooting out domestic terror, but in her hunt for domestic terrorists, she discovers a dreadful truth. ISIS is planning something that could be most devastating: pulling resources and building an atomic bomb on American soil. She is determined to dig into the source of this evil and cut off the head of the snake. But politics is a dirty game, especially when it meddles with the fight against terror. An operation known as Black Moon — a joint operation of the NSA and the CIA — may have dealt ISIS a great blow, but there is worse to come. And it will happen while America sleeps. Can Liz and her team stop the inevitable? Martin Clem writes like a military professional and readers can feel the intensity of the heat and the magnitude of the conflict developed with ingenuity. Liz, the protagonist, was my favorite character —passionate, intelligent, and driven. The prose is great, crisp and filled with military terminology, but it is very accessible. The pacing is fast and the author knows how to keep the reader’s attention. The narrative is done in a strong, clear and confident voice, and the story feels real. Crisis: While America Slept is well written, with a clever plot and a setting that captures the essential elements of what readers would encounter in real political and cultural life, taking readers across international boundaries. A really satisfying read, explosive and electrifying. CRISIS: While America Slept by Martin Clem is a thriller rooted firmly in the march of ISIS. Liz Jennings works for the National Counter-Terrorism Center and has done her homework on ISIS, learning its history and its roots. Now it's time to stop the march, stop them from targeting America, but when she learns that they plan to build an atomic bomb in America, Liz realizes that this is far more critical than anyone thought. Liz is on the trail, but politics are clouding her view and sending her off course. The CIA and NSA have joined forces, creating Operation Black Moon, a clandestine operation that takes the fight to the heart of ISIS, but there is a problem. No matter what the officials do, America’s people have gotten lazy. All ISIS has to do is watch and wait. It’s now no longer a question of when or where they strike; it’s a question of how much damage they can do. 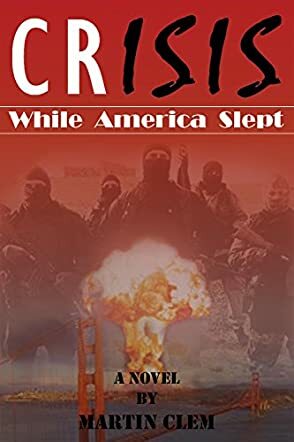 CRISIS: While America Slept by Martin Clem is a very involved story, a clever combination of fact and fiction combined into a riveting story. Martin Clem clearly knows his stuff and I was fascinated by the history he provided on ISIS. I learned more from this book than I have from anywhere else. And given that it is such a current topic, it's quite an eye-opener, providing a real insight into something that should have everyone on their toes. This is not a book for a quick read; it is packed with information and is a twisting, turning story that needs your full attention. Martin Clem has developed his background and his characters very well, immersing them in a thrilling tale that makes for compelling reading, a book that, once you start it, you won't put it down until it's finished. Great story, very relevant to today’s world and I really enjoyed it. There is something very satisfying about reading about modern military events by authors who have obviously served or who have, at the very least, done their homework and done it very well. The late great Tom Clancy had that ability. I was in the service while he was writing, and we adored and appreciated his portrayals of us doing our jobs. If Martin Clem can produce a few more novels of the quality and caliber of Crisis: While America Slept, then it’s a sure bet he will be the next beloved author of American military personnel. His portrayal of us is accurate and filled with respect and admiration. I liked this book. I learned so much. It is rich in the detail that those of us who have been there love so much. Crisis: While America Slept will entertain you, but you might have trouble sleeping peacefully after you read it. I like the way all the characters are portrayed in Crisis: While America Slept. I think there is an even-handed picture of both protagonists and antagonists. But I am willing to admit that I’m probably biased, simply because I am an American veteran. The settings in Crisis: While America Slept also seem exceptionally well done, and this is from someone who has been to a lot of these places under similar circumstances. The plot is very well done. It is as if Martin Clem simply snatched it from today’s headlines. The writing is great. It fits the mood and characters for this type of story perfectly. But again, what I enjoyed most was the attention to detail, especially military detail. That is what makes this novel and Martin Clem stand out above the rest. Crisis: While America Slept by Martin Clem is an exceptional terrorist thriller — the plot is strong, the action intense, and the characters rock-solid. It begins with a prologue that details an operation to take out key ISIS targets in Iraq and Syria, but an operation that only exacerbates things. ISIS has a sinister operation, one they plan to accomplish on American soil, and it will start with the construction of an atomic bomb in the US. Elizabeth Jennings works for the National Counter Terrorism Center and has a very keen interest in uncovering domestic terrorism. Through some luck, she discovers the plans of ISIS, but the only problem is that it would take navigating through a maze to reach the source of the threat. Even the joint operation known as Black Moon, an operation that combines the forces of the CIA and the NSA to fight ISIS, can’t be sure of stopping the threat. And as the clock ticks, the danger becomes imminent while America sleeps. Martin Clem just won a new fan in me and I will be on the watch for works from this author. The story is so real it feels exactly like what is playing out in today’s political landscapes. The characters, the setting, and the conflict are elements that set this story apart and they are balanced in a way that makes readers want to follow the story to the end. Crisis: While America Slept is written in a captivating style and the narrative voice is engaging. There is suspense and the author creates a sense of urgency in the story to make it a gripping read for fans of terrorist thrillers and investigative stories. It’s a real page-turner.